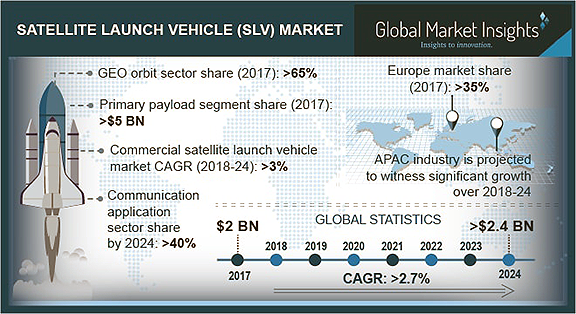 According to a new research report by the market research and strategy consulting firm, Global Market Insights, Inc., the Satellite Launch Vehicle (SLV) Market to exhibit 2.7 percent CAGR from 2018 to 2024. Growing high speed internet connectivity demands in conjunction with the requirement to gain tactical intelligence over the neighboring nations can be achieved through space missions. This in turn has led to increased frequency of launches every year for applications in defense, scientific research, and communication, which in turn will fuel the global satellite launch vehicles market. For instance, in 2017, over 50 missions were successfully deployed for mission critical applications specifically focused on scientific research, earth observation, and communication applications across the globe. International Launch Services (ILS) is an American Russian joint venture that was formed as private spaceflight partnership among Khrunichev, Lockheed Martin (LM), and Energia. ILS exclusively owns rights for global civil and commercial sales, and mission management of Angara, and Proton Breeze M. Growing emphasis on international co-operation for providing launch services for commercial applications and small economies is expected to drive the overall satellite launch vehicle market size. Regulatory norms restricting the knowledge and resources sharing of technologies related to the launch owing to mission critical applications are expected to hinder the technological developments in the industry space. Moreover, high initial cost of the launch and associated environmental problems and limitations are expected to be among the major factors expected to hamper the satellite launch vehicle market growth through the forecast period. Operator states are highly focused on the protectionism of local producers, specifically in the Europe and the U.S. Moreover, China and the U.S. that hold substantial positioning in the global industry have limited participation in the commercial sector, is expected to present considerable challenge to the satellite launch vehicle market share. However, these nations are expected to increase the number of the commercial launches over the coming years, to strengthen their presence in the commercial launches sector. Based on orbits, GEO satellite launch vehicle segment is expected to retain its industrial dominance through the forecast period. It can be attributed to the substantial application in communication and earth observation among its primary payload applications. Increasing number of payloads to accommodate large number of satellites in singular missions to reduce the overall cost is expected to drive the 6 to 10 number of payloads segment through the forecast period. However, owing to significant number of mission critical applications, and probability of large capital losses in the event of mission failure, primary payload segment is expected to retain its dominance through the forecast period. Commercial satellite launch vehicle market segment is expected to witness highest growth over the forecast timeframe. Navigation, earth observation data for oil & mineral exploration, biomass measurement, providing access to critical information small economies, and communication will provide strong growth prospects through the forecast timeframe. High competition between Russia and European Union to uphold dominance in the commercial segment will drive the segment growth. Increased launch frequency owing to substantial number of follow on missions to provide efficient communication will present strong growth prospects over the next 6 years. Communication application segment is expected to account for over 40% of the global satellite launch vehicle market revenue share by 2024. In terms of the number of orbital satellite missions every year, Asia Pacific dominated the satellite launch vehicle market share in 2017. However, the U.S. satellite launch vehicle market segment is expected to dominate the overall industry share by 2024, owing to the increasing participation of private companies and high number of follow-on missions scheduled in the region. 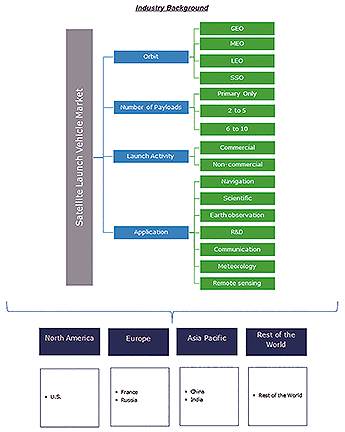 Some of the major satellite launch vehicle market participants include ARCA Space, Blue Origin, Boeing Space and Communications, Bristol Spaceplanes, E Prime Aerospace, Eurockot, Indian Space Research Organisation (ISRO), Kelly Space & Technology, Lockheed Martin, Mitsubishi Heavy Industries, Northrop Grumman Corporation, Scaled Composites LLC, SpaceX, and Virgin Galactic. High product demands with reduced satellite deployment costs, reduced overall weights, and large payload carrying capacity are expected to remain chief client requirements. Low mission costs in Asia Pacific region, and high success rates of European Union (ESA) and Russian space missions will provide stable growth platform for the industry growth through the forecast years.